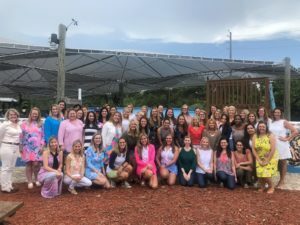 The Junior League of the Palm Beaches, Inc. (JLPB), hosted its annual summer leadership retreat on June 9th, 2018 at Loggerhead Marinelife Center. Present at the retreat were the JLPB board of directors, management, and leadership team. The conference was led by the 2018-2019 Executive Team and the Executive Vice President, Melissa Perry. This annual retreat gave League members a chance to meet other leaders within the committee that they are serving on this year. Topics such as effective communication, servant leadership, finance management, and effective meeting skills were discussed. During the retreat JLPB Board Member, Marcelle Burke, announced the creation of the Diversity and Inclusion Task Force. This task force will encourage an inclusive environment at the JLPB organization and aim to work with a more diverse group of individuals, organizations, and communities moving into the upcoming year. To help Palm Beach County improve and grow, the women of JLPB take the time to be trained and educated to effectively impact their community. During the 2017-2018 League year, efforts made by JLPB included: collecting and distributing necessities for children in foster care, mentoring young adults in the foster care system and the Department of Juvenile Justice, providing eye & ear screenings for preschoolers, raising awareness towards human trafficking, and partnering with various nonprofits on Done In A Day activities across the county.